U.S. House Speaker Paul Ryan says Republicans' proposed tax changes won't just benefit the top 1 percent of income earners in America — and he’s "bullish" about the proposal passing Congress before the end of the year. 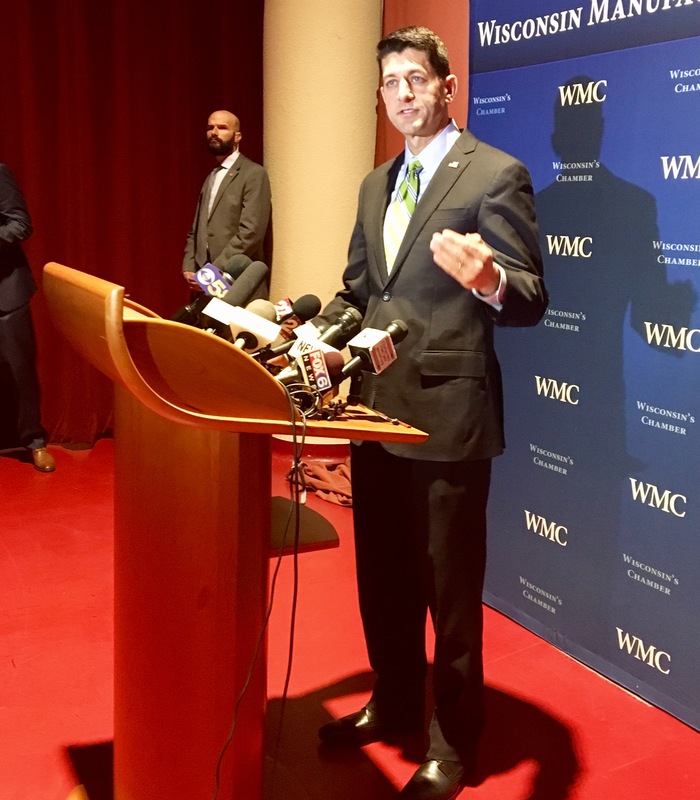 Speaking with reporters Monday in Madison, Ryan defended the plan after some reports have shown it would disproportionately benefit the wealthy. "Put the class warfare aside," Ryan said. "We're going to lower taxes for middle class taxpayers, we're going to make it easier for families living paycheck to paycheck to finance their lives, and we're going to make taxes better for businesses so we can keep businesses and jobs in America." A study by the Institute on Taxation and Economic Policy in Washington DC found about 60 percent of the proposed tax cuts would benefit the top 1 percent of income earners in Wisconsin. Ryan said Monday he hadn’t seen that report, but maintained his stance that cutting taxes on businesses would help middle-income people by creating more jobs. He said the U.S. Senate is the biggest obstacle to the tax package passing by the end of the year, but he remains "bullish" about its chances. Ryan, who appeared at an event held by Wisconsin Manufacturers and Commerce, also defended President Donald Trump's elimination of Affordable Care Act subsidies. The Trump administration announced last week it will stop helping low-income people pay for insurance through ACA exchanges. Ninety percent of Wisconsin residents who buy insurance on the exchange have been eligible for those subsidies in the past. "But the answer is not just shovel more money at a failing program that's doubling premiums and causing monopolies," Ryan said. "The answer is to reform the underlying failure of the law, and one of those underlying failures is the lack of choice and competition in health insurance." Ryan said subsidies just "prop up" Obamacare. He supports a policy that would allow states to set up their own insurance markets and include high-risk pools for people who would have trouble getting insurance because of things like pre-existing conditions. Editor's Note: This story was updated with original reporting from WPR at 4:14 p.m. Monday, Oct. 16, 2017.